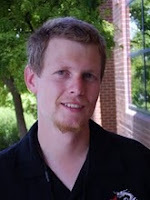 A couple of years ago, I presented a bit of an abortive post on wasps of the family Pompilidae, the spider-hawks. Despite their striking appearance and relatively high visibility, I noted, it was nigh on impossible to find reliable taxonomic information on them. 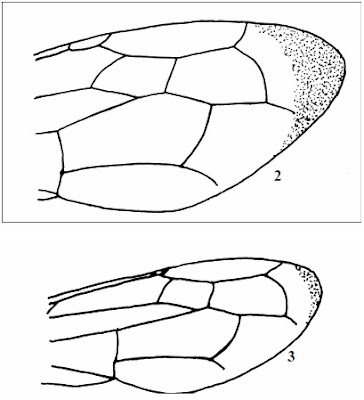 Diagram of the forewings of Cryptocheilus australis (above) vs Heterodontonyx bicolor (below) from Wahis (2008), showing the differences in the shape of the marginal cell (the large cell along the top margin of the wing). This question came back to the fore for me recently when I had to attempt to identify a number of spider-hawks for work. With no recent key available for Australian pompilids, I had to try and piece together clues. As it turns out, a large part of the difficulty in identifying spider-hawks is that they are, overall, a conservative bunch. Though coming in a range of sizes and colours, they tend to be structurally uniform. This makes it difficult to find reliably key-able characters, and means that evolutionarily quite distinct species can look superficially quite similar. Take, for example, one of the most 'familiar' of the Australian pompilids, the black-and-orange Cryptocheilus bicolor. Recently, Wahis (2008) established that this was not a true species of Cryptocheilus, but belonged to a distinct (albeit related) genus as Heterodontonyx bicolor. The two genera can be distinguished by the shape of the marginal cell in the forewing, which is distally pointed in Heterodontonyx but rounded in Cryptocheilus. The thing is, many of the photos one may find online labelled as 'Cryptocheilus bicolor' are true Cryptocheilus, not Heterodontonyx. Those on Wikipedia may be correctly identified, but these here are not. Not every large orange-and-black spider-hawk in Australia is Heterodontonyx bicolor. Specimen of Telostegus inermis, copyright Josef Dvořák. So what of Telostegus, the genus that I was complaining about being unable to find the diagnostic characters for in my earlier post? Evans (1972) describes it as having bifid tarsal claws, and a vena spuria in the forewing. A vena spuria ('spurious vein') is a fold in the wing that might be mistaken at first glance for a wing vein. In the images above, it can be seen as a dark line along the middle of the wing in the dorsal view. 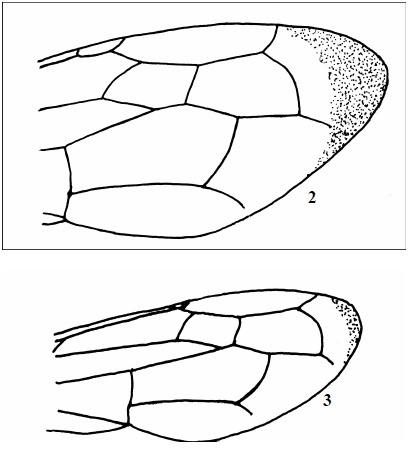 Evans (1972) separated two genera of spider-hawks, Telostegus and Elaphrosyron, on the basis of the number of submarginal cells in the forewing (two in Telostegus, three in Elaphrosyron) but more recent authors have not regarded this distinction as valid. Evans, H. E. 1972. 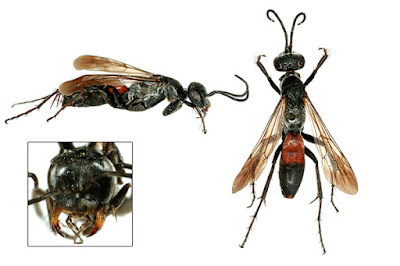 A review of the Australian species of Elaphrosyron and Telostegus, with notes on other genera (Hymenoptera: Pompilidae). Breviora 386: 1–18. Wahis, R. 2008. Contribution à la connaissance des Pompilides d’Australie (Hymenoptera : Pompilidae). 2. Sur quelques spécimens récoltés par G. Else (Natural History Museum, London) avec descriptions de deux espèces nouvelles des genres Auplopus et Ctenostegus. 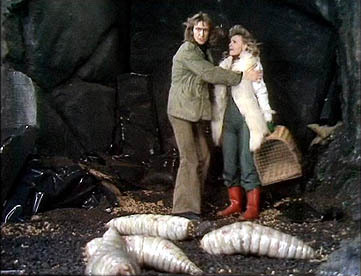 Faunistic Entomology 61 (1–2): 23–31. I'm curious ... what's the basis for distinction in "evolutionarily quite distinct species can look superficially quite similar" -- molecular? Also, do entomologists consider these to be cryptic species? or is wing venation enough even if hard to see? We field botanists complain when morphological differences between species are tiny or subtle, but after reading this, I guess we shouldn't whine! I'm curious ... what's the basis for distinction in "evolutionarily quite distinct species can look superficially quite similar" -- molecular? In this case, just referring to convergence in features such as size and colour pattern in species that more structural features would place in separate genera. For instance, here in Australia there is a complex of bright blue and orange pompilids that has been treated in the past as a single species. When it was reviewed by Evans in 1982, he identified species of two quite separate genera in this complex, with each genus also including species with different colour patterns. The original 'species' in this case seems to be a Müllerian mimicry ring. Most entomologists wouldn't refer to this level of distinction as 'cryptic', because cases where species can only be distinguished by fine features are not uncommon (wing venation would count as a fairly large-scale character that is easy to see: if you can identify something by wing venation, you're laughing). Field identification of insects is often not a simple prospect! Interesting, thanks for the reply. I looked into Mullerian mimicry and other types ... looks to be a very strong driver towards convergent evolution. I'm not sure there's anything that "convergent" in plant morphology. When living in California, I used to love watching tarantula hawks (Pepsis, in the Pompilidae), they are very active fliers and very conspicuous, audible while flying even from several meters away. It's too bad there isn't a good key for your region, but I find that when I have to thumb through descriptions I learn a lot more about the group and it's important features than when I go through a key (especially when the key is straightforward). Maybe the quickest path isn't always the best one.